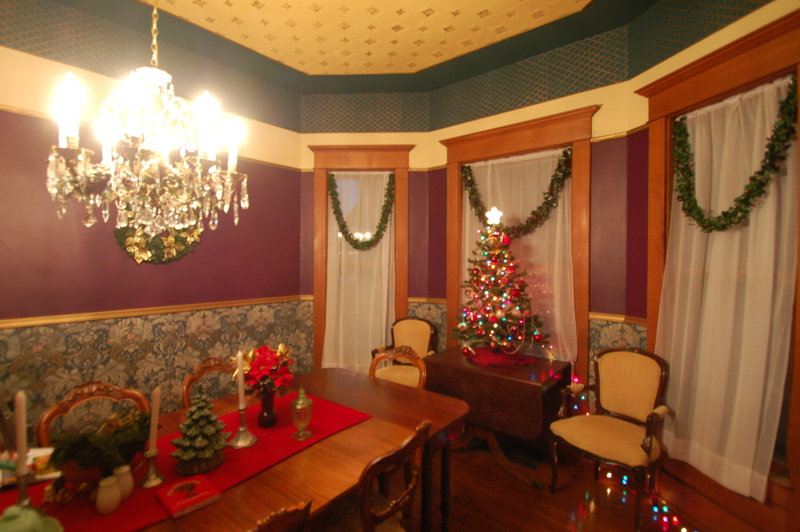 Oh, Victorian Christmas. There’s so much I want to do with you, but it’s hard when the rooms aren’t done. But, I’ll show everyone what I have right now! When this is all being stored, it seems like we have too much. When it’s in the house, it seems like we need so much more. After all, in Queen Anne Victorians, more is more. 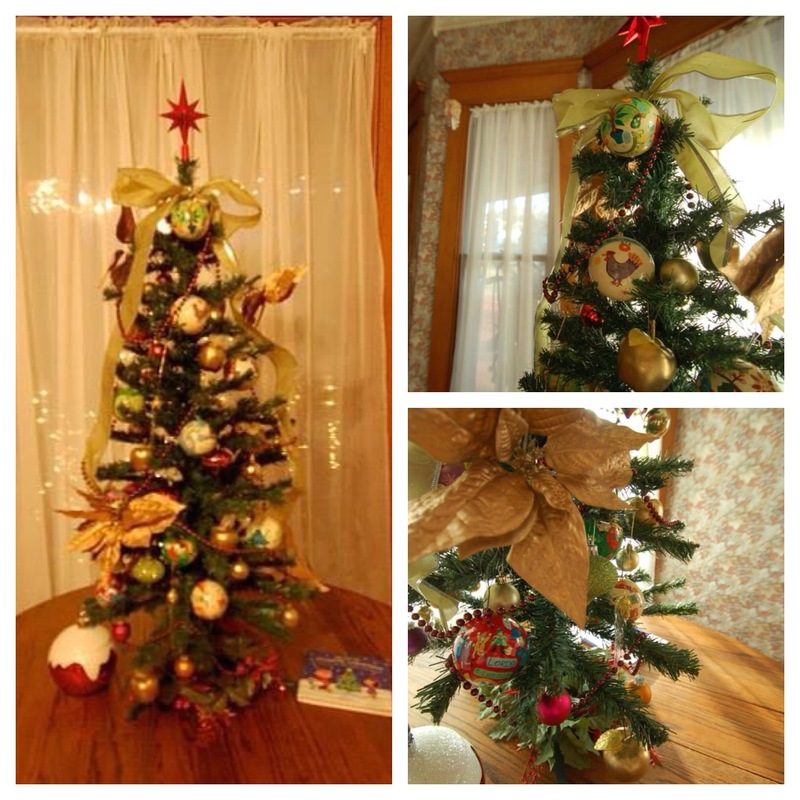 Do you have a tree for each room? No. But I will, in some form. 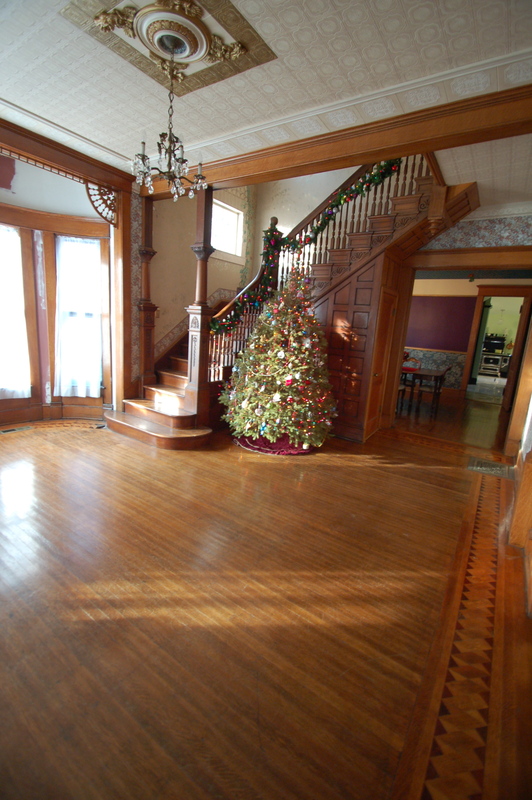 Except for maybe the kitchen, which has to be clear for our Holiday Party. But, I even have an idea for that. How many trees do you have? Depends on your definition of tree. Some people don’t count them unless they are over 5′ tall. 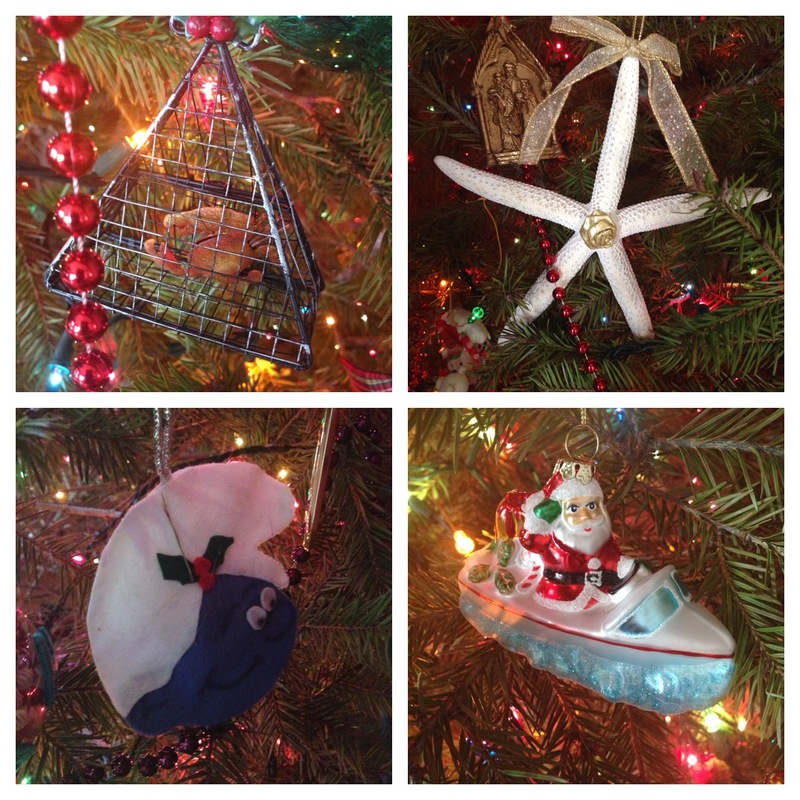 I, however, count them if I can hang an ornament on them, even if they are more miniature. With that in mind, I have 13, including the one on the porch. 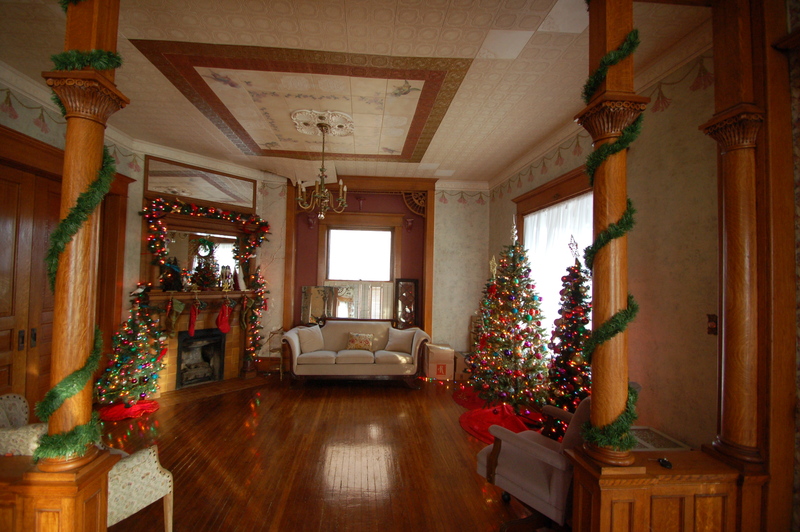 So, here goes – the inside of the house for 2014! 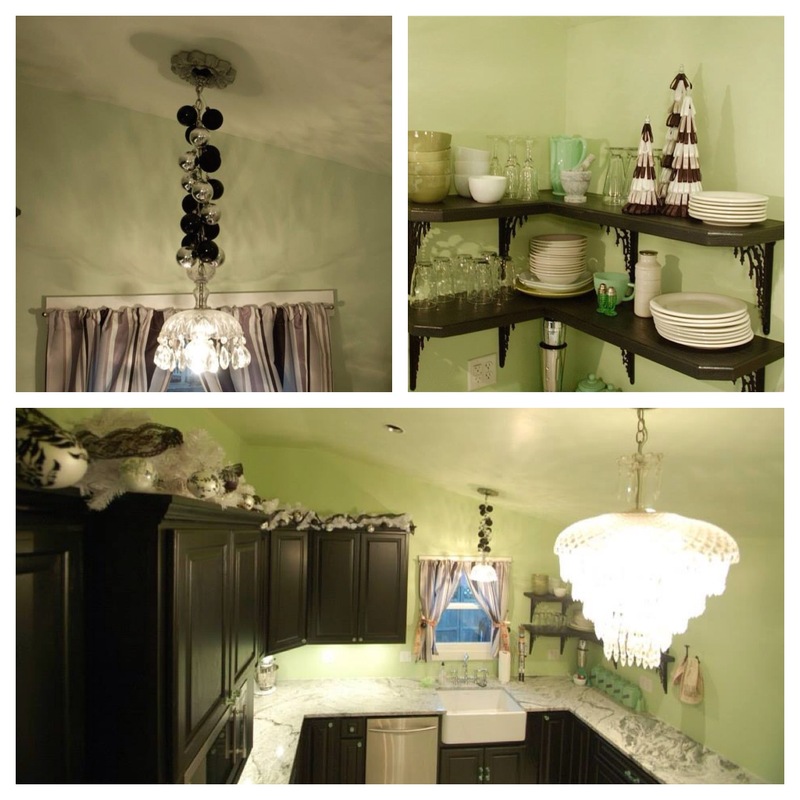 If you have brilliant ideas (you know, besides finishing walls and ceilings and painting walls and getting furniture), I’d love them – I’m always looking for new things! 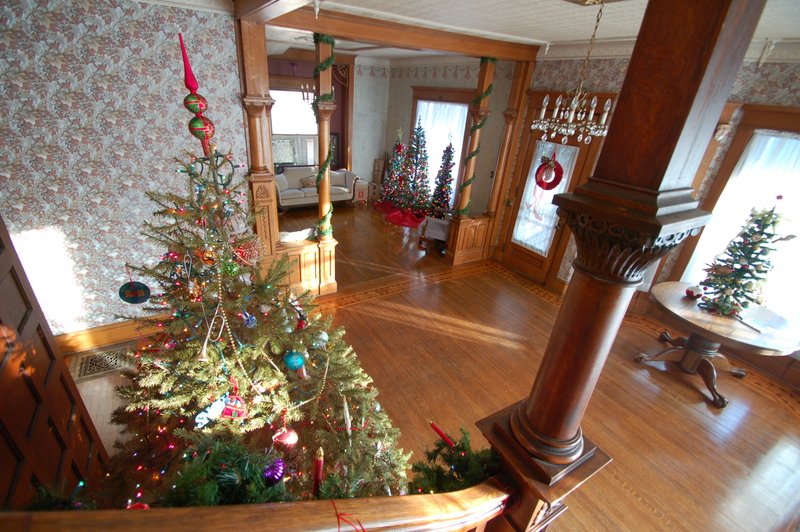 The Entrance Hall has the live Christmas tree, which we get from the tree farm that one of my student’s family owns. I grew up with a live tree, and I love the smell and the authenticity. 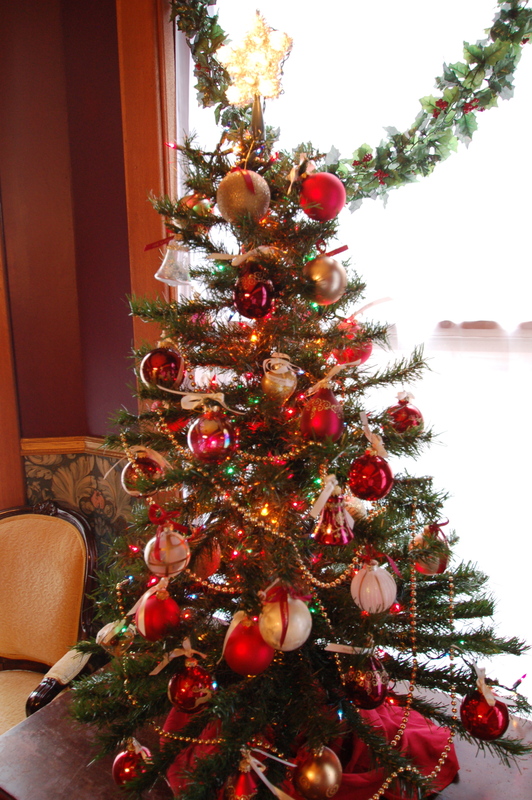 This is the main present tree. 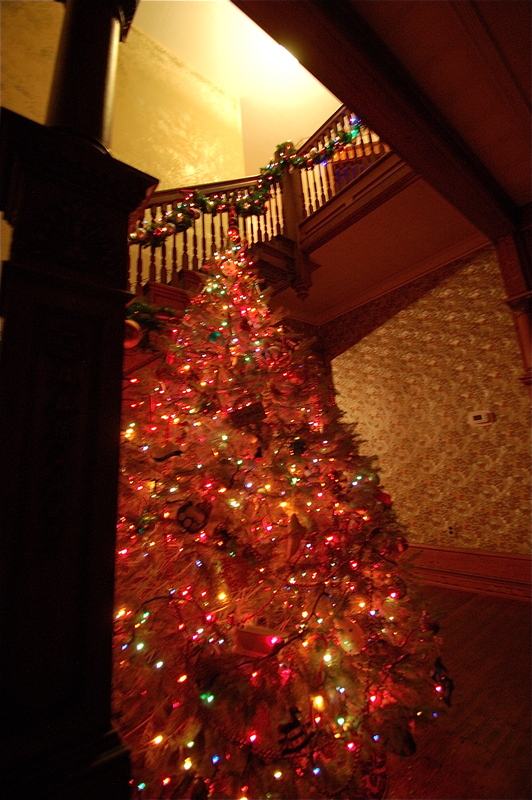 Since you’ve seen the tree on the porch, this is tree number two. 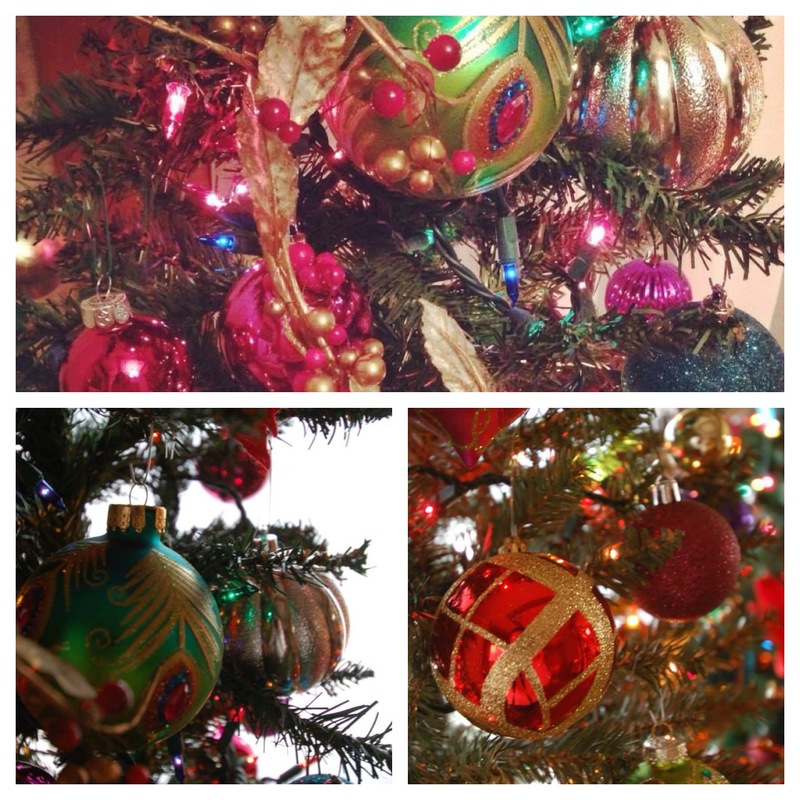 Most of my trees are “theme-y,” or at least color coordinated. This one, however, has the mismatched, personal, tell-a-story ornaments. The Mrs. and Mrs. Claus with my name on it from when I was little, the vintage glass “Partridge in a Pear Tree,” Mr. Hedgehog-or-Porcupine, reminders of projects and hobbies, a wedding gift, glimpses of our love of the ocean, a felt Smurf from elementary school, and Santa in a Speedboat. Lots of memories and smiles. 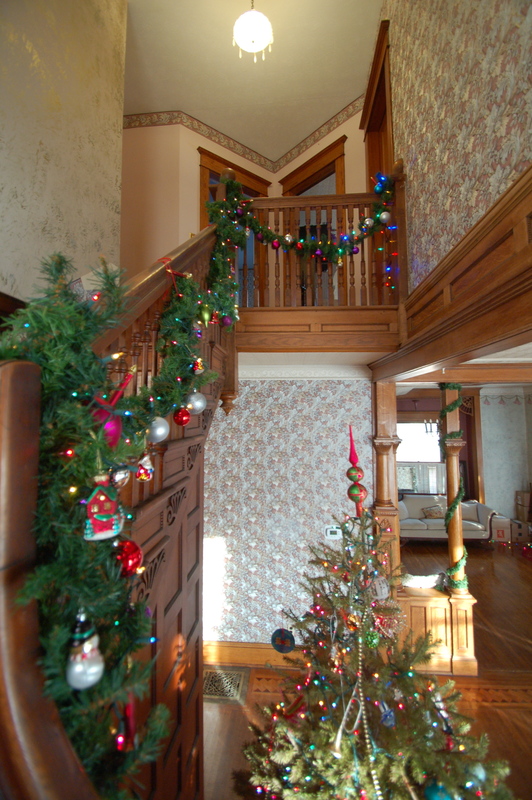 Garland lines the stairwell (I always hang it with ribbon to avoid scratching the wood). And it looks lovely, though somewhat fuzzy, at night. 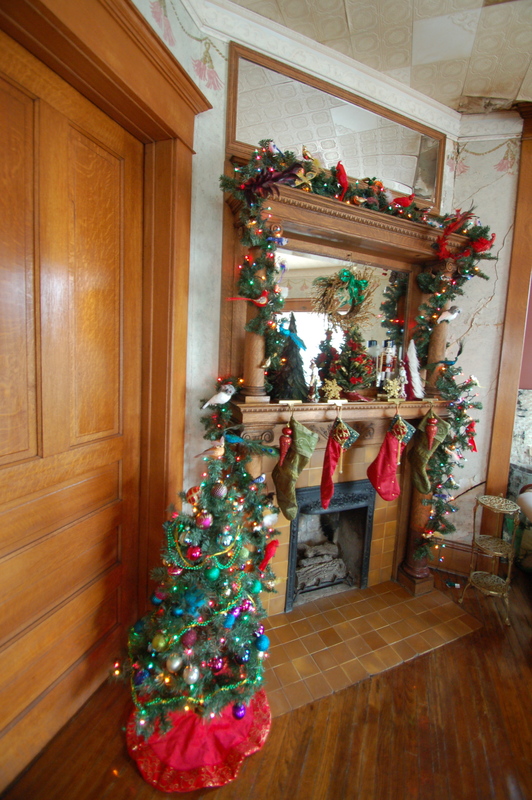 Also in the Entrance Hall is tree number three, which is the “Twelve Days of Christmas” tree with an ornament for each day included in the song. If you could have just one of the 12 gifts, which would you choose? (Seriously. I want an answer from you in the comments). I would choose Geese-A-Laying. I mean, that seems practical. But, Lords-A-Leaping following me around would also be incredibly entertaining. 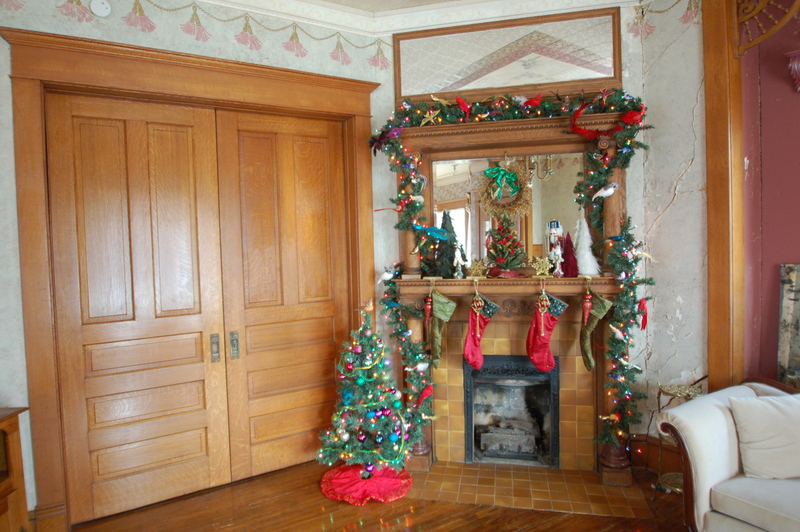 Wreaths inside and outside of the doors is always a good idea. 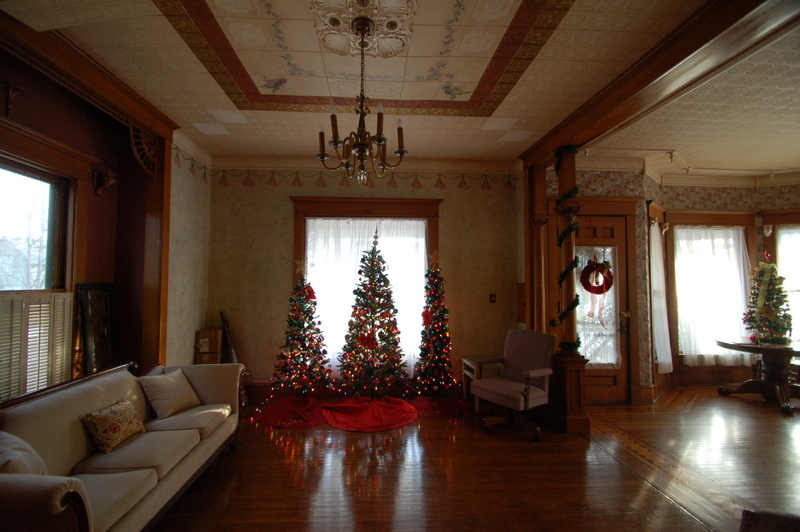 I am really, really excited to have the front parlor restored, because in my eyes, it will be amazing at Christmas. Last year, when we didn’t have a lot of furniture downstairs (and we still don’t), I thought “Let’s make a forest!” So there are three trees in the front window (trees four-six). Tree seven is the little guy next to the fireplace. 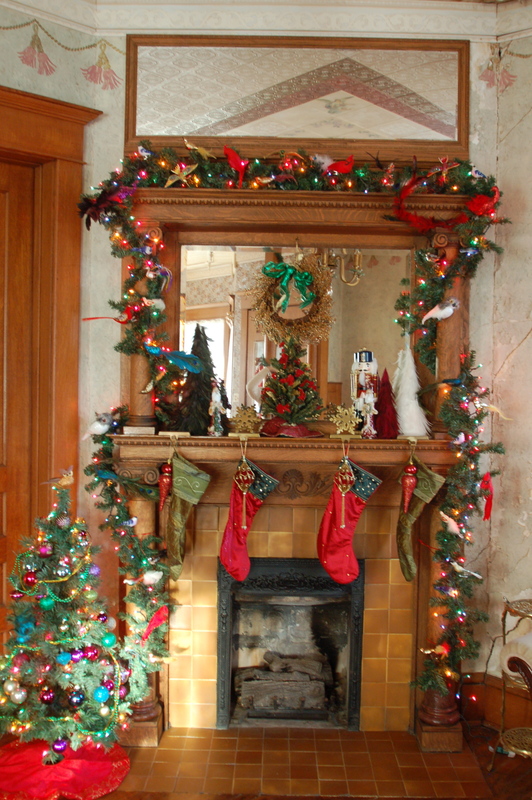 The mantle has garland and trees and nutcrackers. It’s pretty fun. 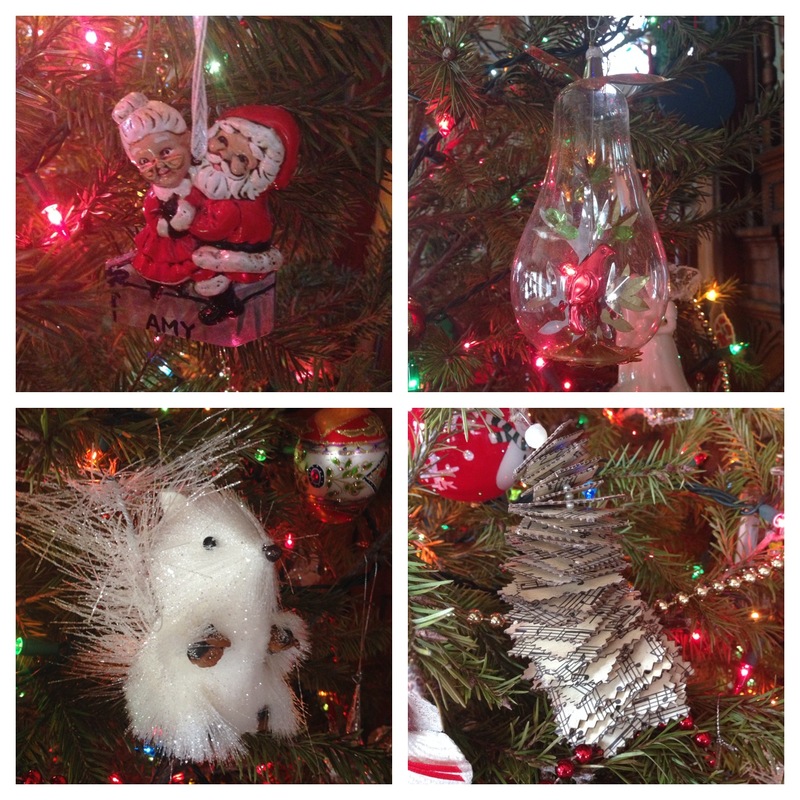 Most importantly, however, it holds my collection of bird ornaments, which are my absolute favorite. The red beauty is the absolute love of my life. 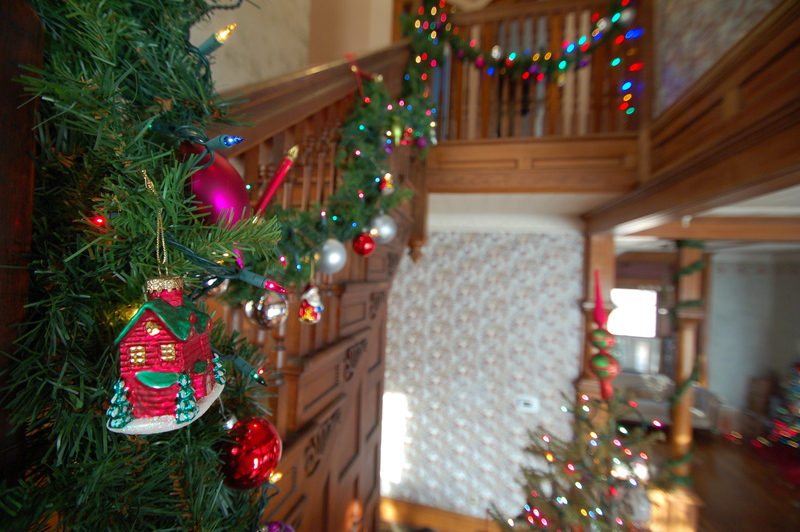 More of these lovely colors from the front parlor forest! 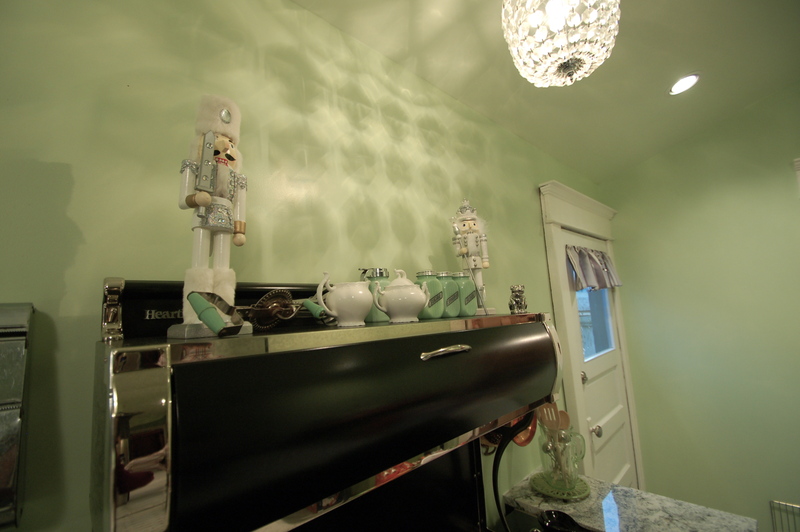 I mean, really, this is probably the color story for the downstairs restoration. 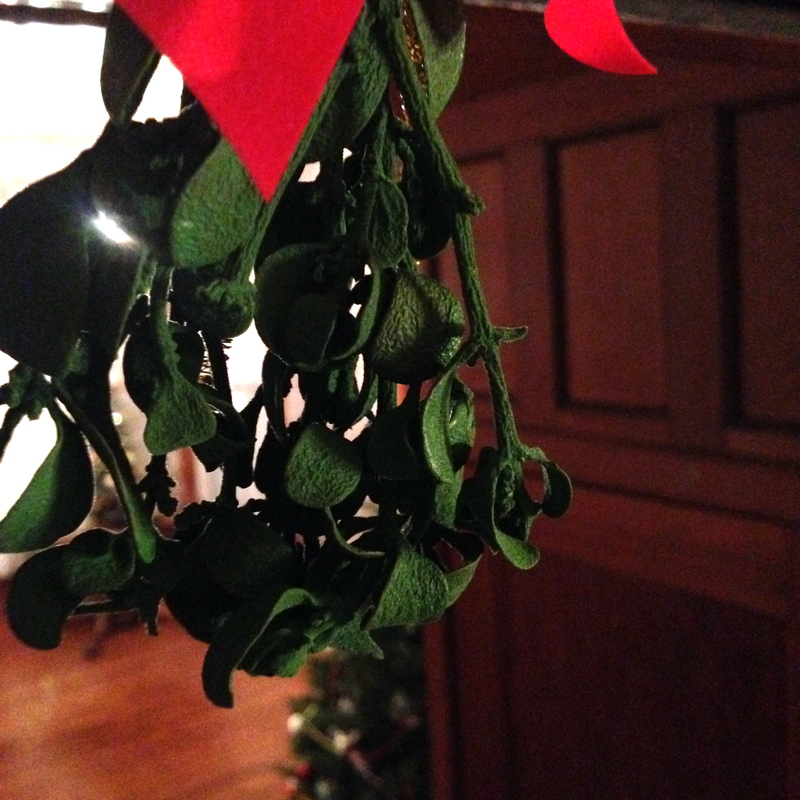 Heading into the dining room is mistletoe. Every year! 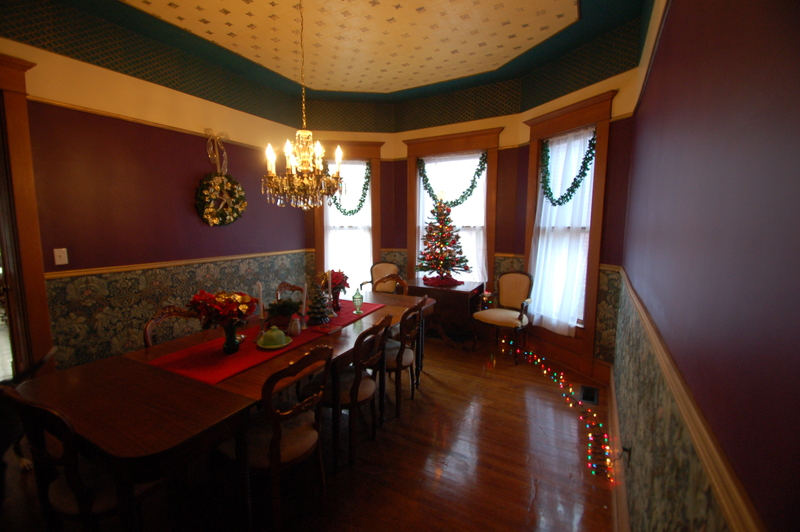 The dining room is pretty simple. 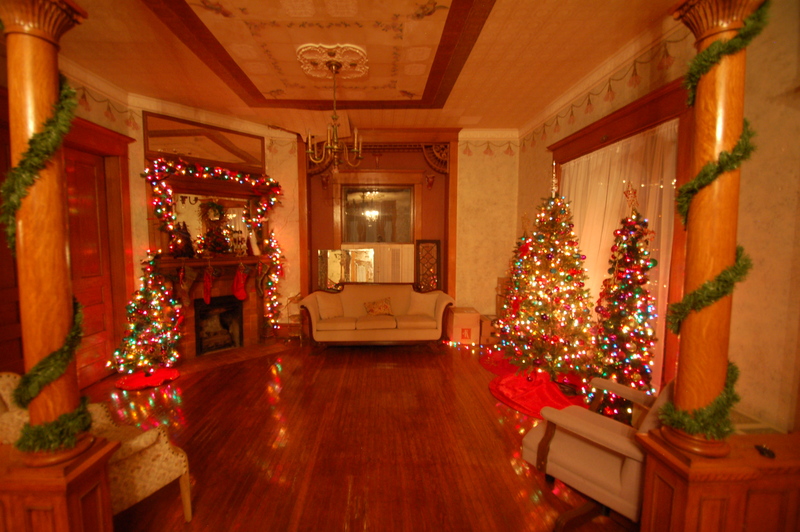 This room’s tree (tree eight) has the leftover ornaments from our wedding. We were married on December 15, and I tied ribbons with our wedding date on a couple hundred ornaments for our wedding guests as a wedding favor. These are the ones that have made it 13 years! 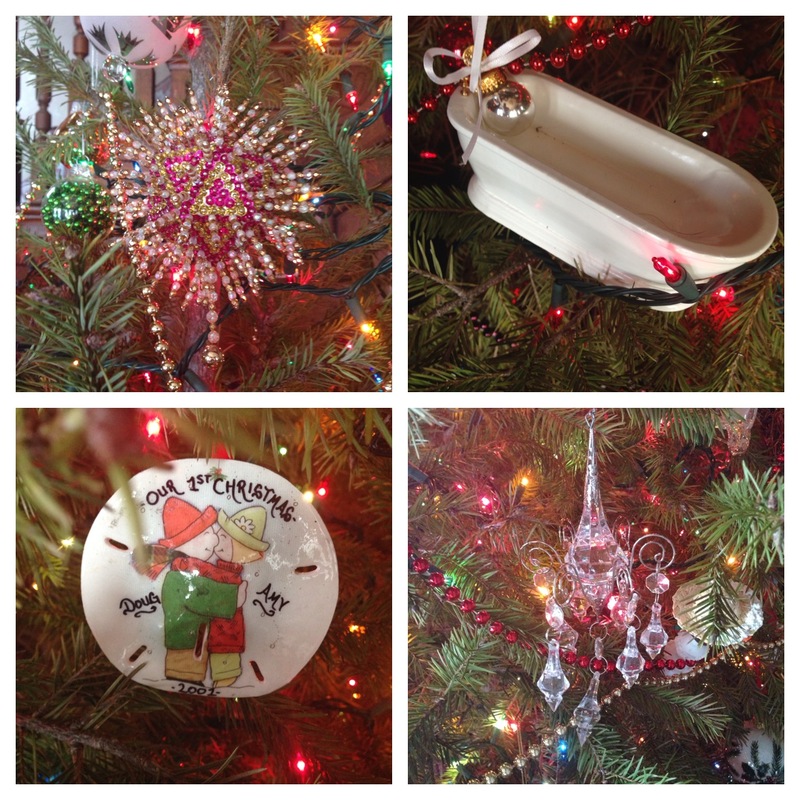 The table holds Christmas Decorations that didn’t have a home – and they made a lot of sense here. I’m still trying to figure out where everything goes in this house – the last house was down to a science! 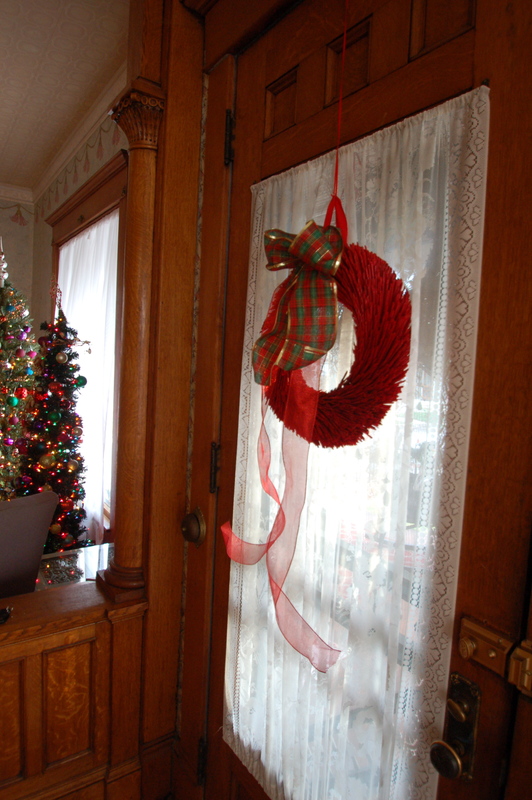 The chandelier has garland intertwined, and the ceramic tree was made by the mother of one of my students – she is taking pottery classes and made that for me this year. It blows me away – I can’t believe she made it. The “library” has no books or bookshelves, but it does have tree number nine. This used to be decorated in black and white in our last dining room, but here, so far it’s fairly homeless, so it’s in this mostly empty room, dressed in silver and white. 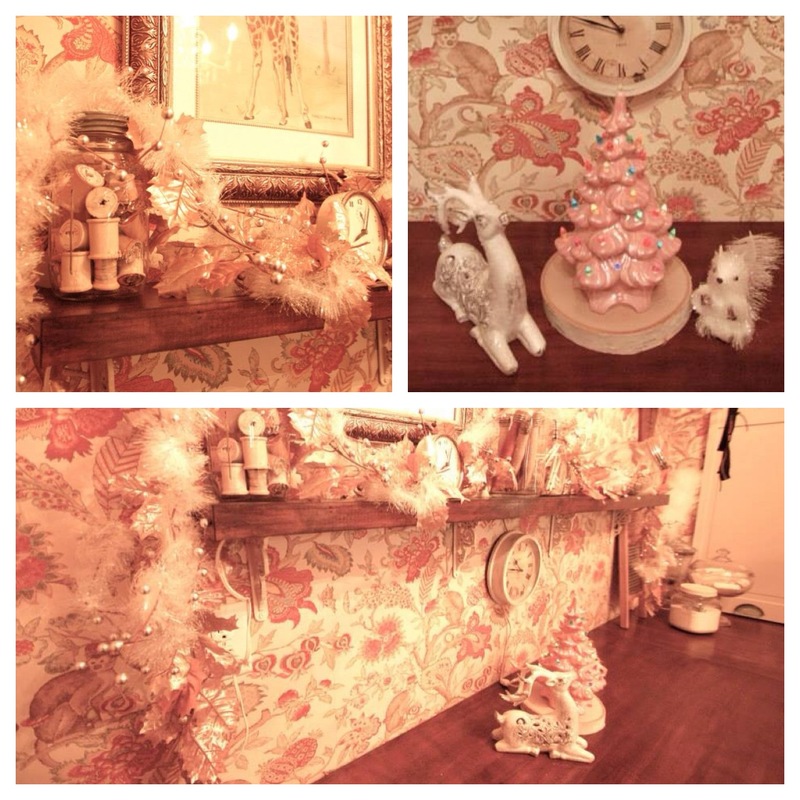 The laundry room has some garland, a reindeer, Mr. Hedgehog-or-Porcupine’s Twin, and the only pink ceramic tree I’ve ever seen in my life (so I snagged it). My Aunt has one of these trees – a larger green one – that belonged to my grandmother, and I have always loved it and wanted one. 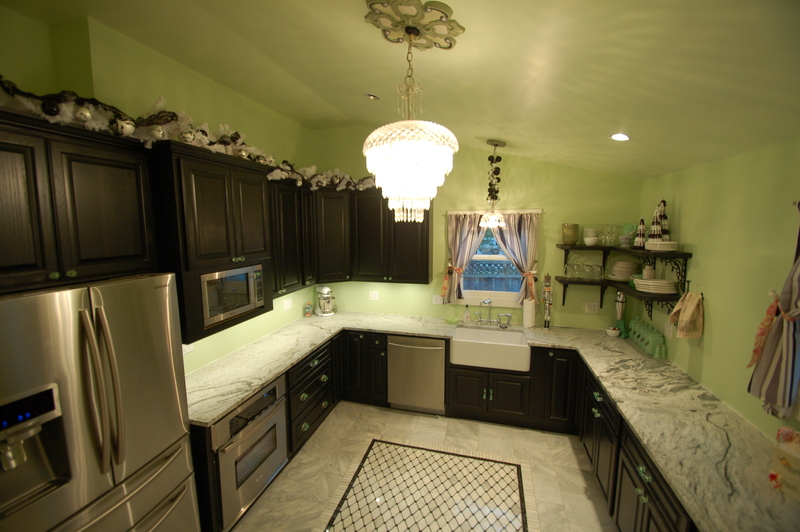 So when I found this one that matched the laundry room, it was a no-brainer. 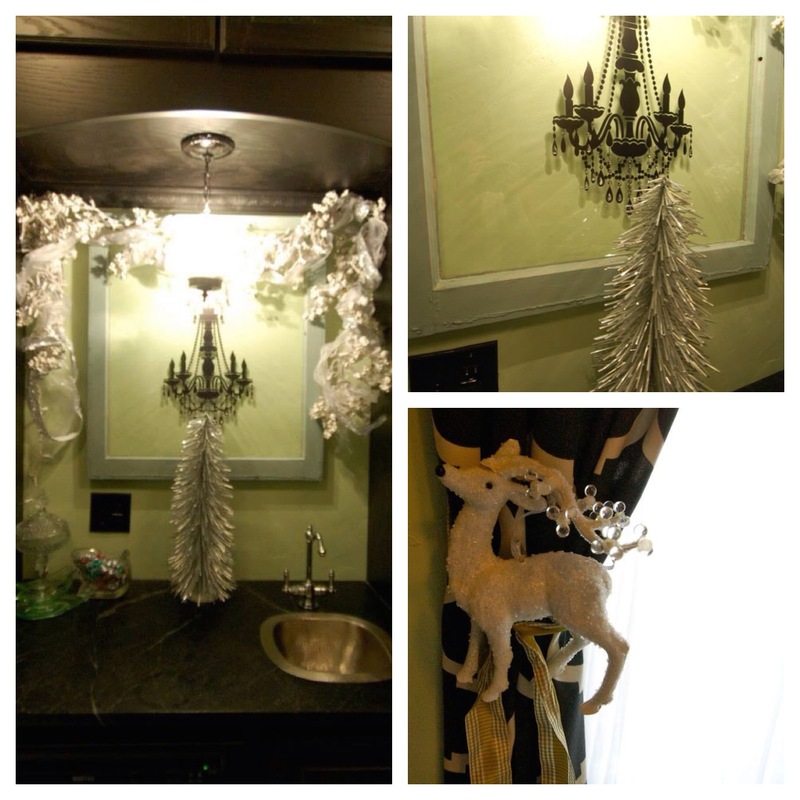 The Butler’s Pantry includes white garland, a very fun foil tree, and reindeer-ornaments-turned-curtain-tiebacks. 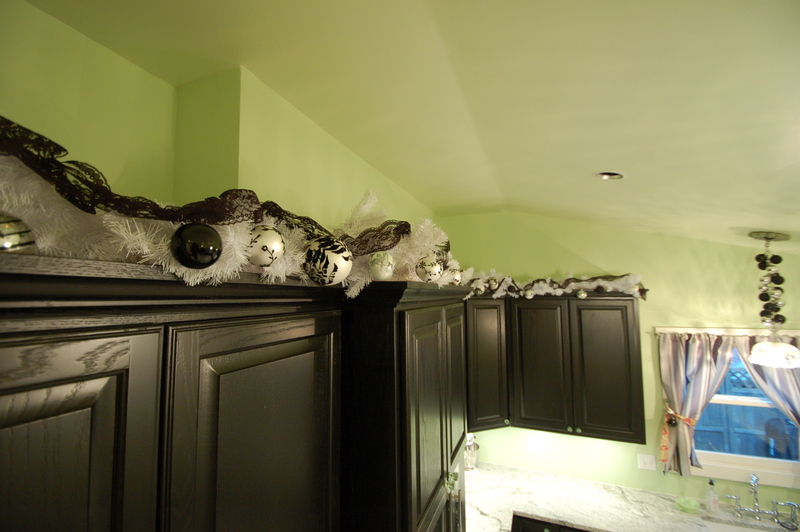 The kitchen inherited all the black-and-white ornaments from the last dining room, but on garland over the cabinets. It’s not lit, because we weren’t that forward thinking. 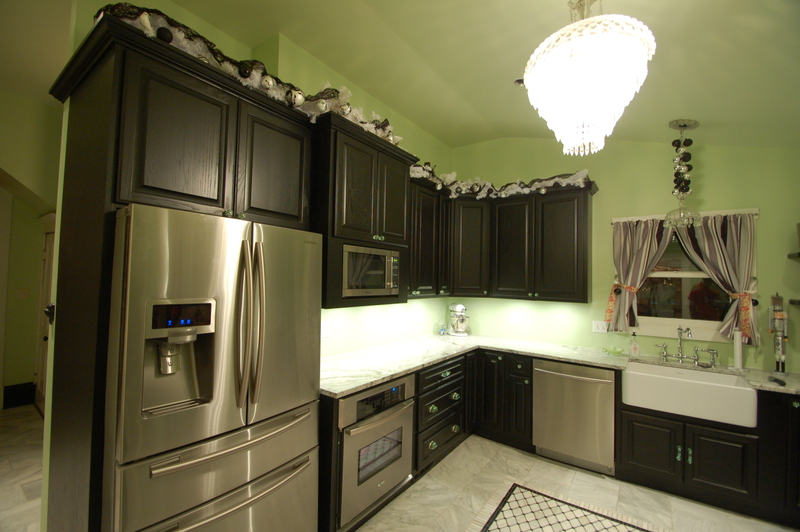 But Doug assures me we can make it happen for next year – we’ll add an outlet above the cabinetry. 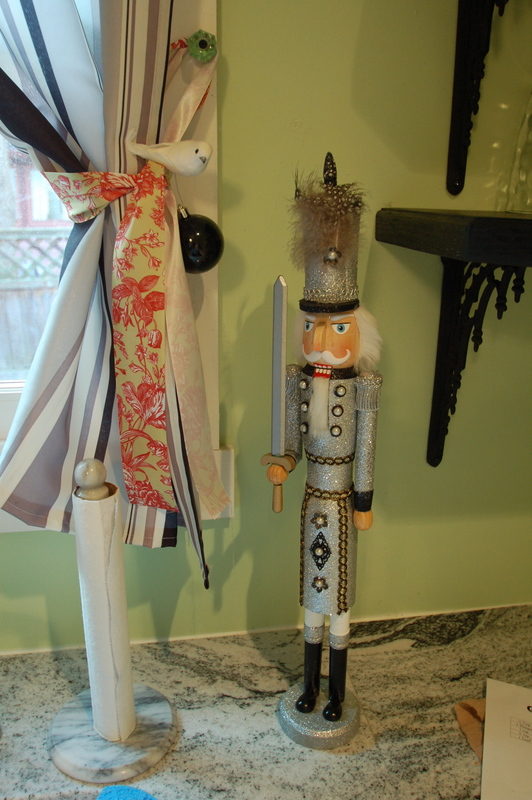 We also have some glittery gentlemen standing guard. They are fabulous and wonderful. 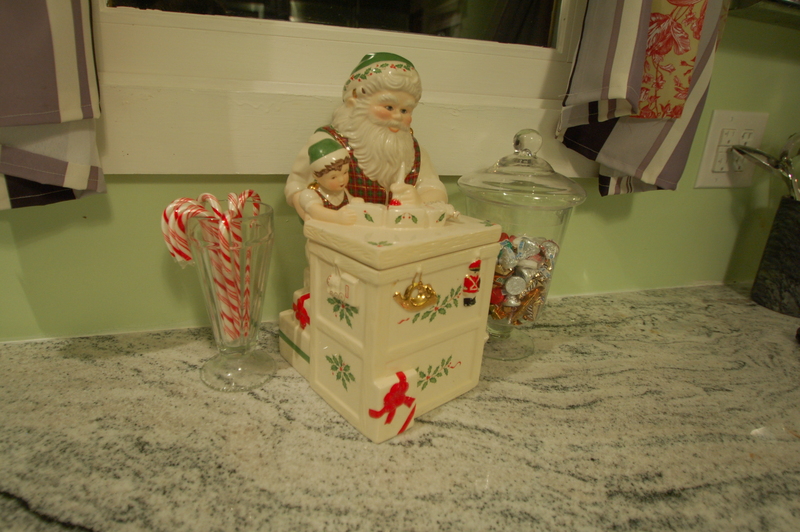 This vintage cookie jar was a gift from my mother last year, and it’s just perfect. Ornaments on the pendant, and a few other details. Tree number ten is the smallest tree that I count, a silver foil friend that lives in my office. 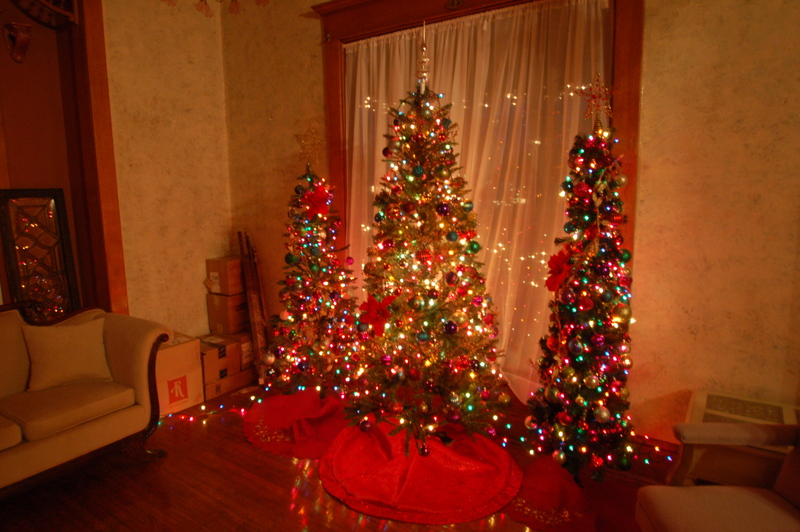 The other small one (eleven) is the first tree that I owned when I went to college, complete with tiny wooden ornaments and bubble lights. 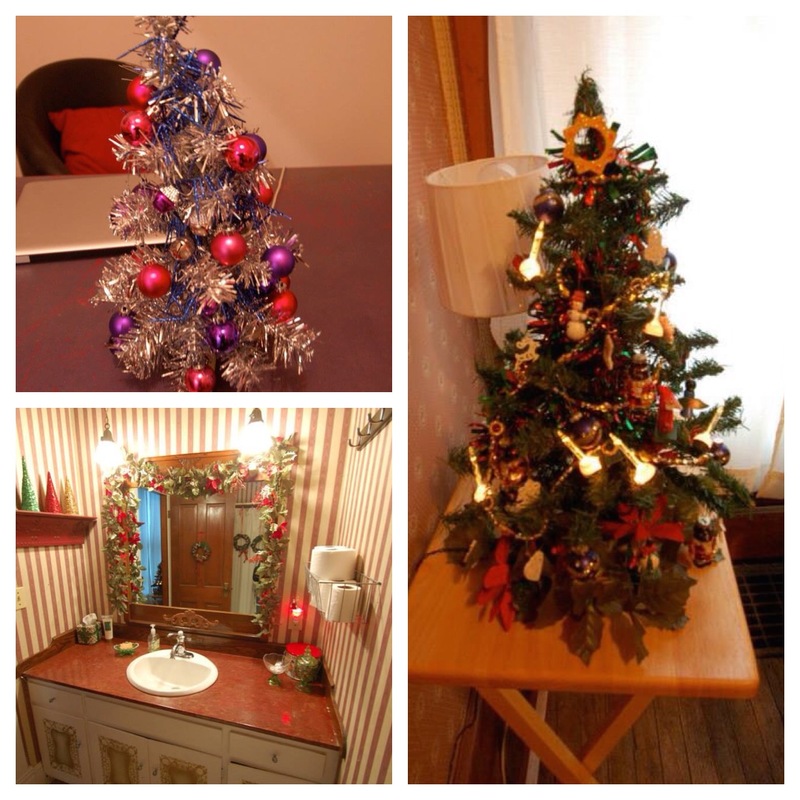 Also, the ugly downstairs bathroom looks downright festive with leftover decorations! I had an extra tree (twelve) that had a home in Jackson Street, but didn’t have a home here. So, I put it in the most ridiculous place I could find. And, there is no filter on that picture. 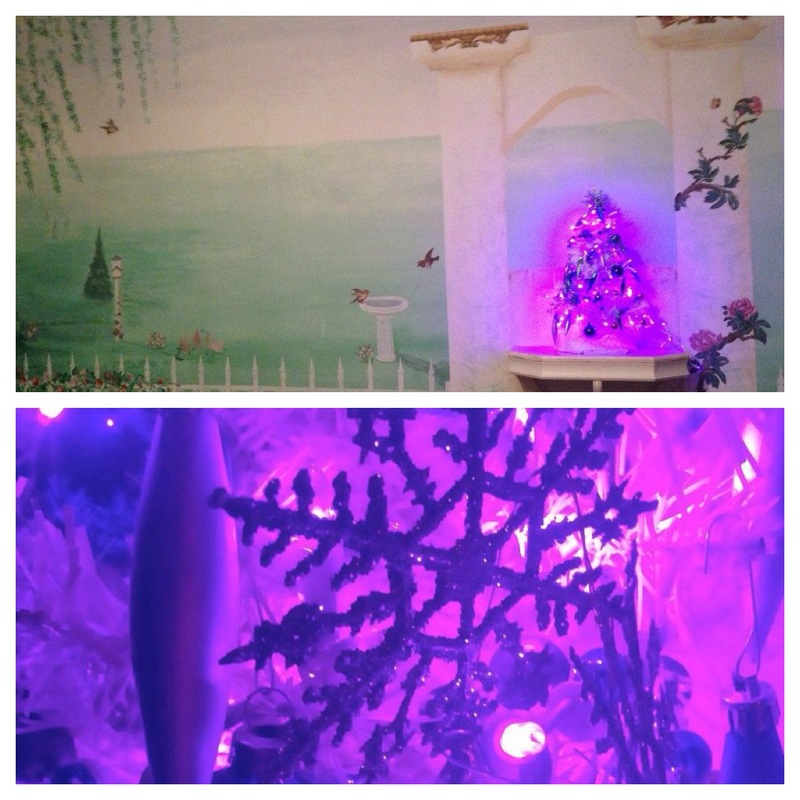 It just glows pink (it’s a white tree with purple lights). 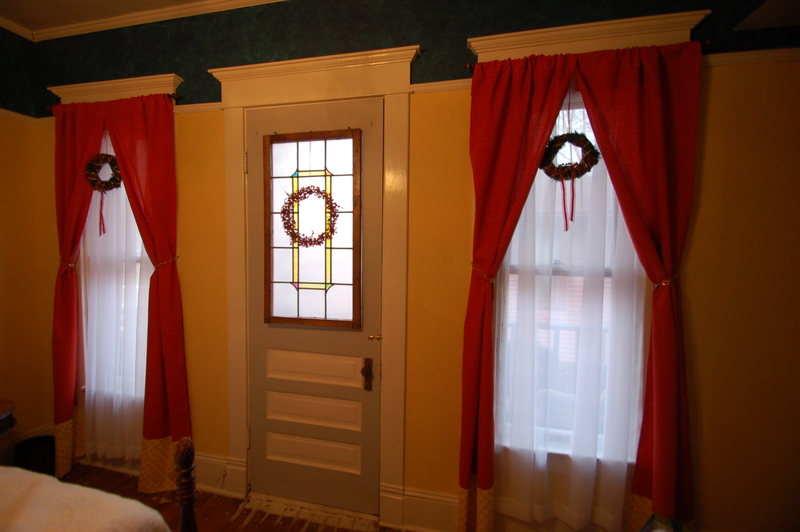 The balcony bedroom has a few wreaths on the windows and door. Simple. And some rustic decorations are on the bookshelf, including a fantastically ancient copy of “Hans Brinker and the Silver Skates,” which is so old that there isn’t a date on it. The artwork is incredible, but it scares me to pieces every time I touch it. 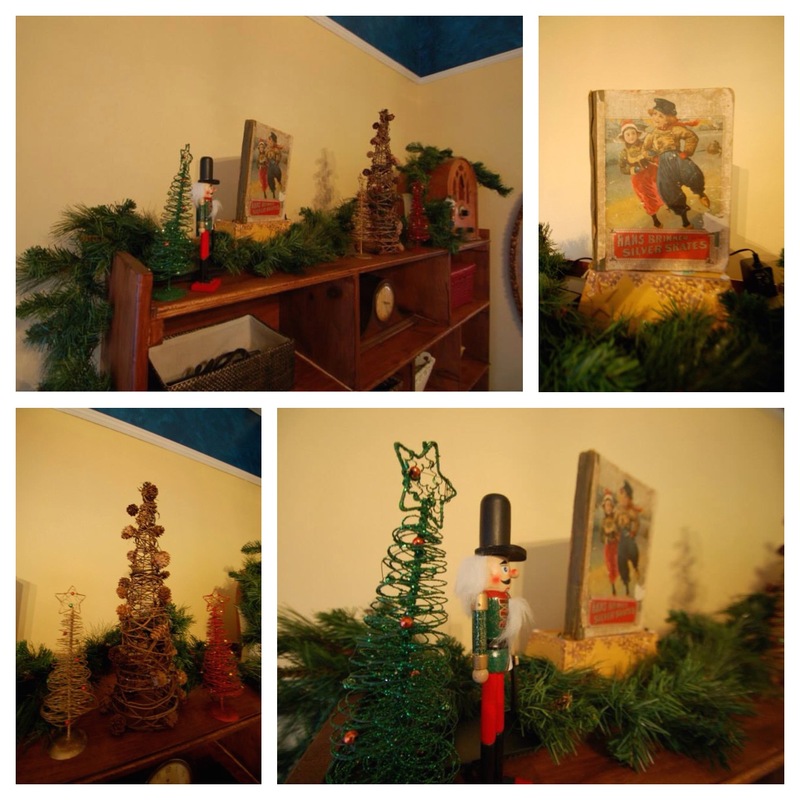 The wooden tree, which I love so much, was a JoAnn Fabric find, and the small nutcrackers and the metal trees are from the Dollar Store. 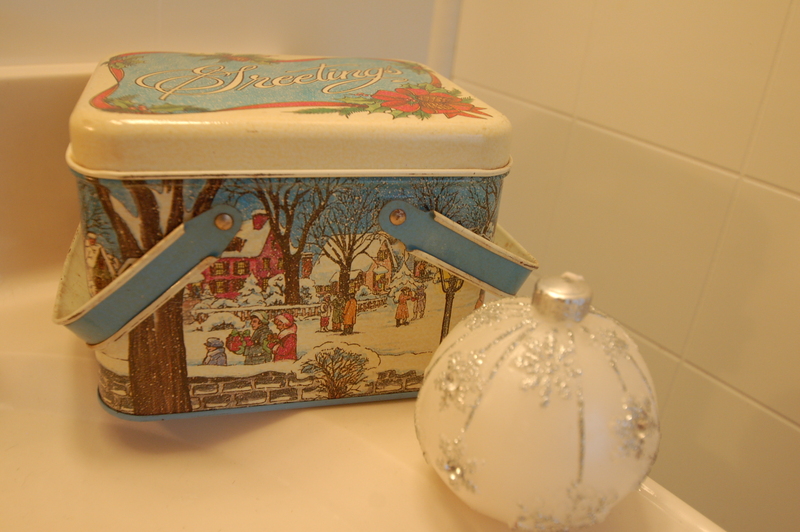 There’s not much going on in the balcony bedroom bathroom, but this vintage tin is a favorite. 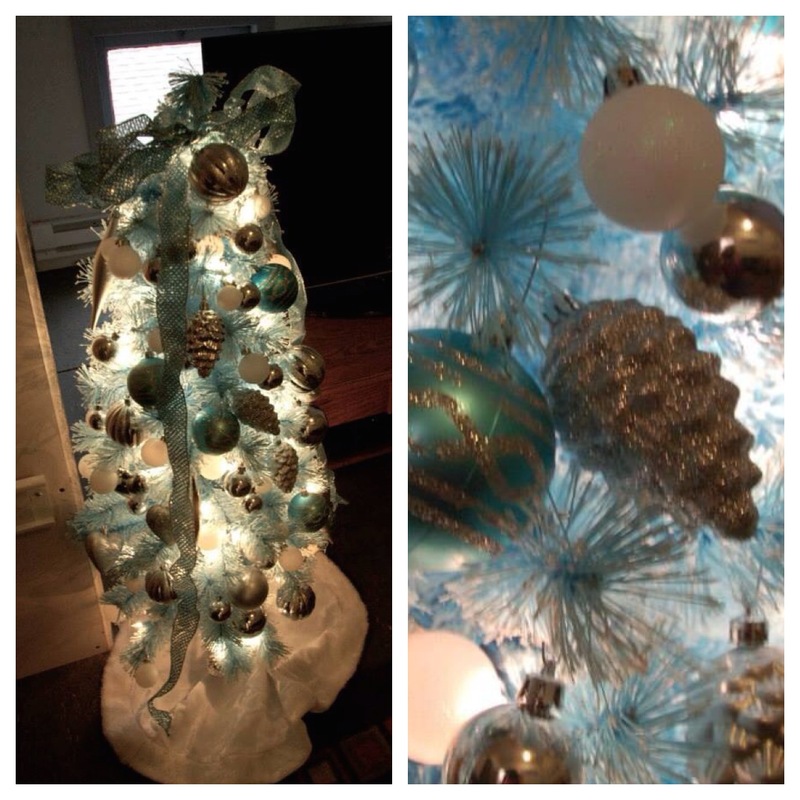 The third floor living room is mostly blues, so when I found this baby blue tree (the last – number 13) at an antique store for $5 a year ago, it found the perfect home in this room. 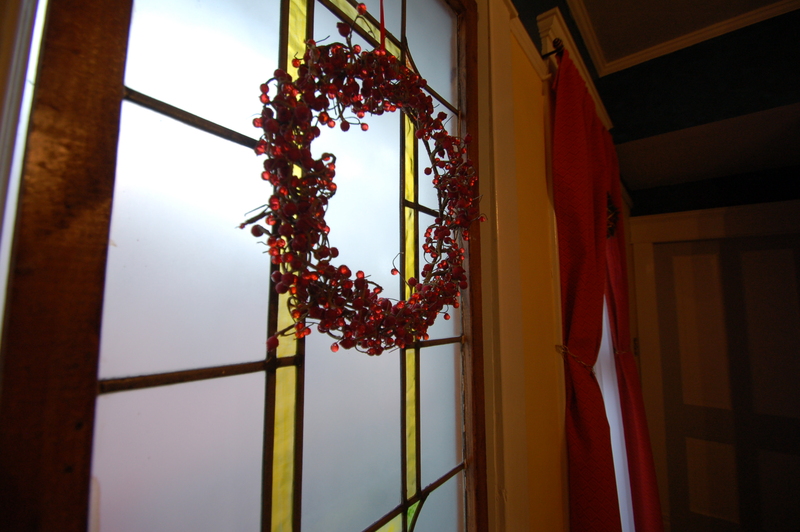 For about three years, I have hated this wreath. And haven’t hung it up. But I wanted something Christmas-y in the third floor bedroom, so I ripped it apart, added lights, and added ribbon I liked that matched the room. And my shoes. Perfect. Whew. That was a lot of pictures. If you stuck with this post this far, you are pretty awesome. 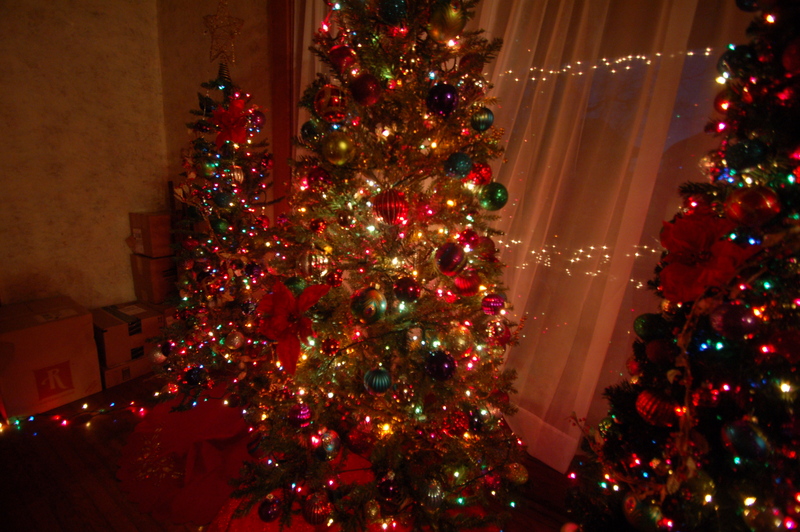 Also, Merry Christmas, Happiest of Holidays, and the Most Joyful of New Year’s to all of you!!!! Thanks for reading about all of our projects – it means a lot! Next PostFinishing a Room? What? 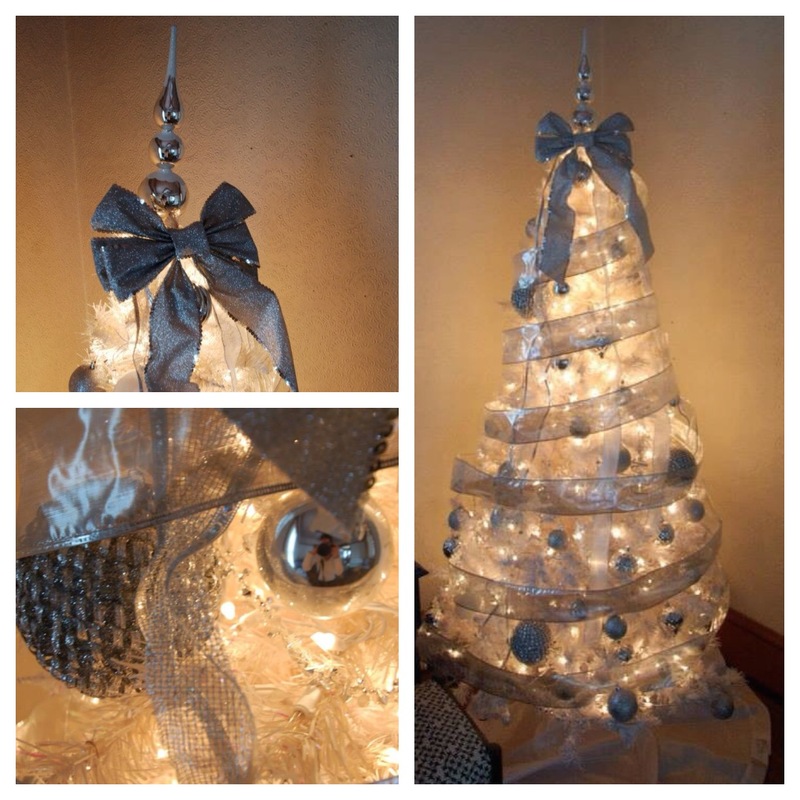 I LOVE that your shoes made the decorations list! Merry Christmas! Merry Christmas, Sky! 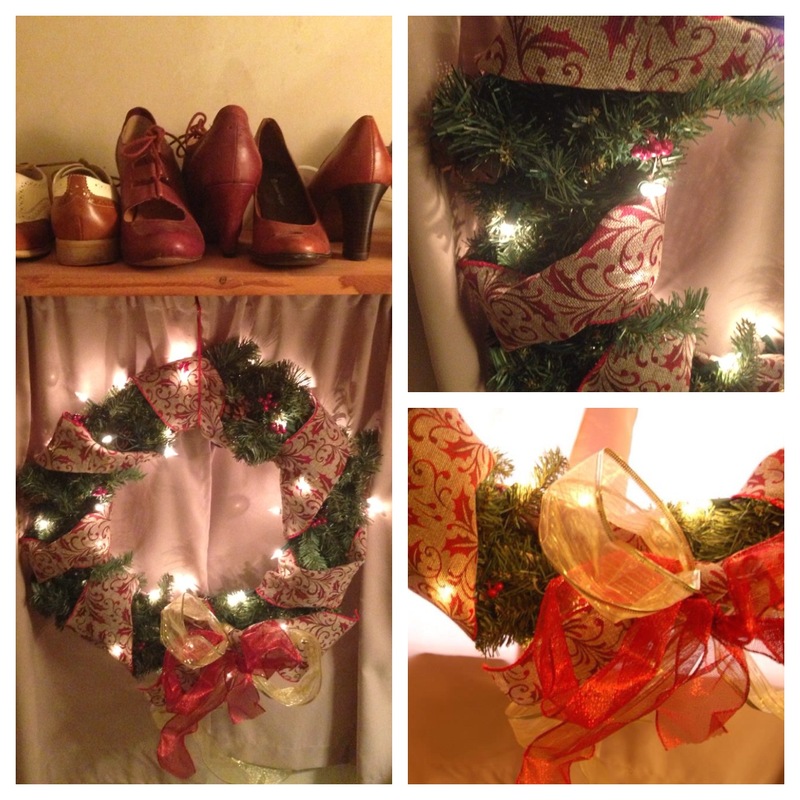 I need to figure out how to make a Christmas tree OUT of shoes. Hmmm…. Number one, your house is stunning, and number two, how long did this take you??? Thank you so much! That’s a good question – I would say, it takes a solid weekend and a few evenings. I’m pretty much a whirlwind, and I have fun with it, so it doesn’t feel like it takes that long. Next year, I’ll have to time it, because that’s a great question! Absolutely lovely job, Amy! As you know, we decorated vicariously through you this year, and I have to admit we are extremely pleased that our (your) efforts turned out so beautifully haha! 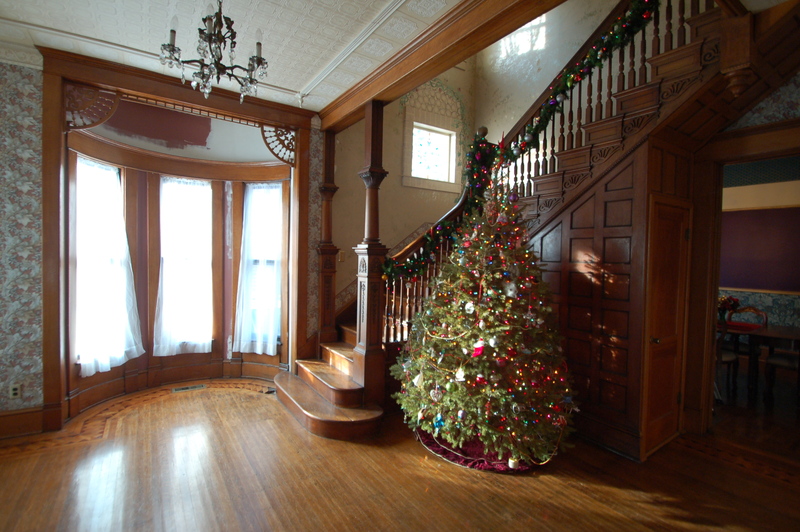 Seriously though, all of your decor looks so wonderful and your home seems really festive (yet still very cozy)! All you need is that little bit of snow for the finishing touch! Merry Christmas to you and Doug! The no snow thing is killing me. But I’m so glad you love it. You put me under such pressure! I love that purple tree next to the ridiculous(ly awesome) more than I can adequately express in one comment box. I love this reply! My husband is convinced that we can’t lose the mural until everyone we know has seen it. He’s also making a case for a giant curtain, so we can still look at it whenever we want. I think it’s perfect for a Disney Princess photo shoot. And I thought Halloween was over the top wonderful. It looks great! Now how long will it take you to pack it all up again? 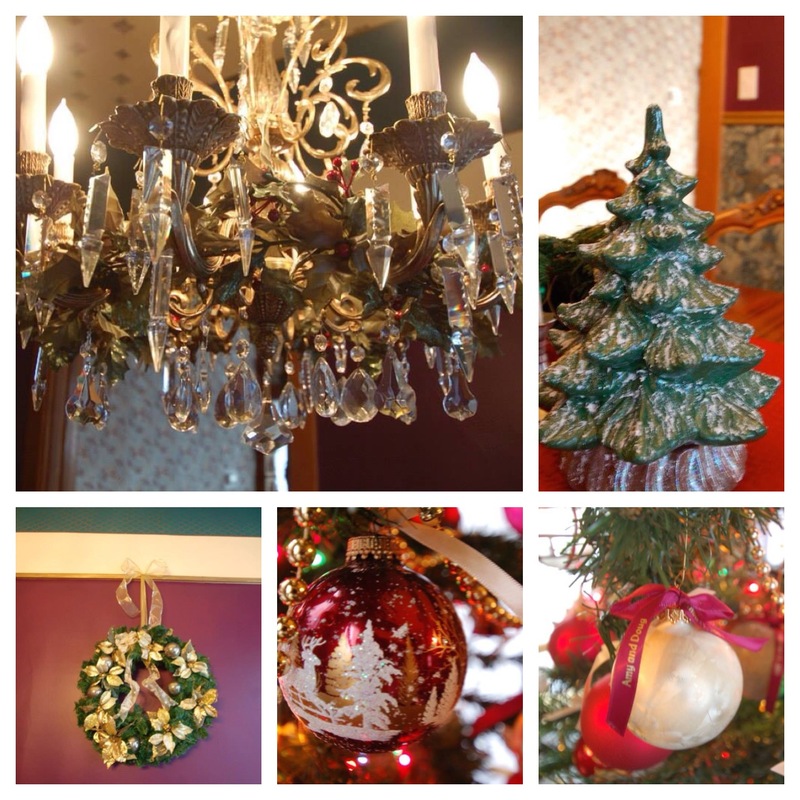 I love putting up decorations, but hate taking them down. I drag my feet like crazy. I would have to say I’d take the maids a milking because we do go through a lot of milk in this house. Also,I should add you have made me look at old houses comepletely differently. 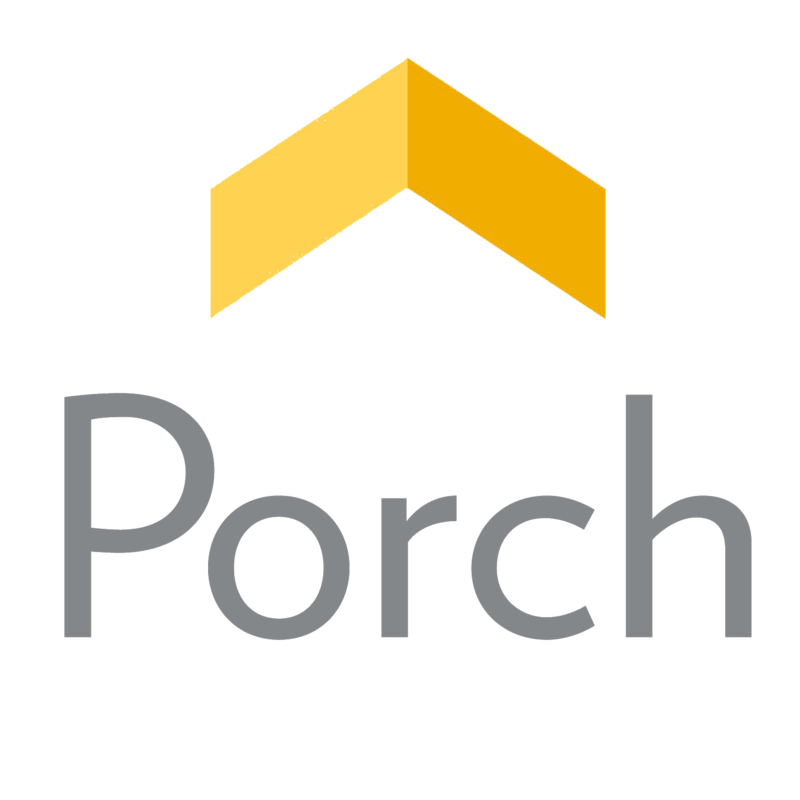 When I was home for Christmas I kept driving down the old Main st. of my hometown looking at the old houses and checking out their porches especially. I blame you. This makes me super happy! 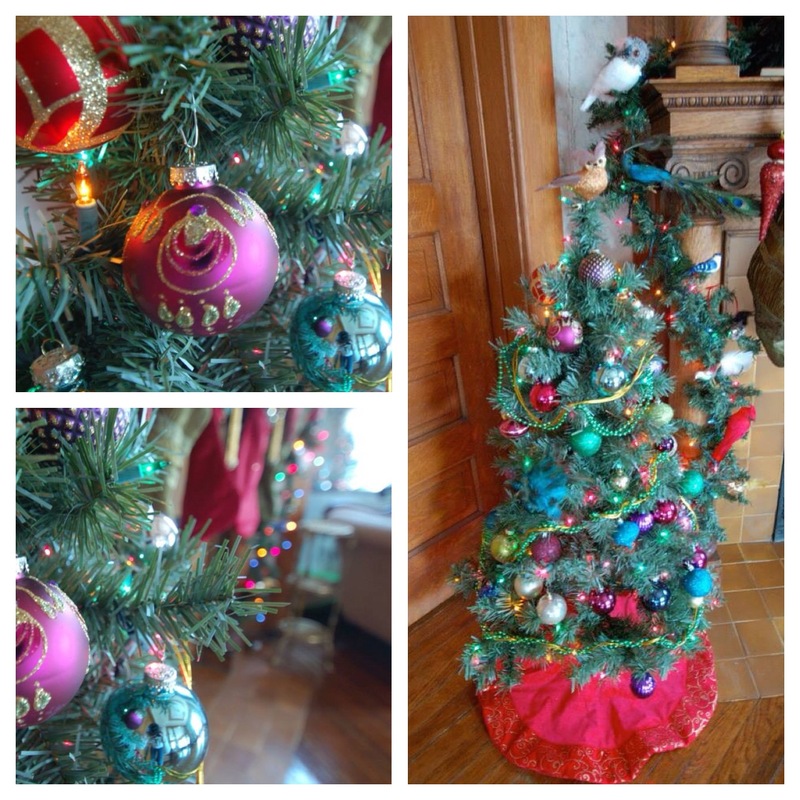 I love that you have a tree just for your bird ornaments, because so do I. Last year, I got a tiny tree that looks very woodsy and realistic with pine cones, red berries, and flocking. 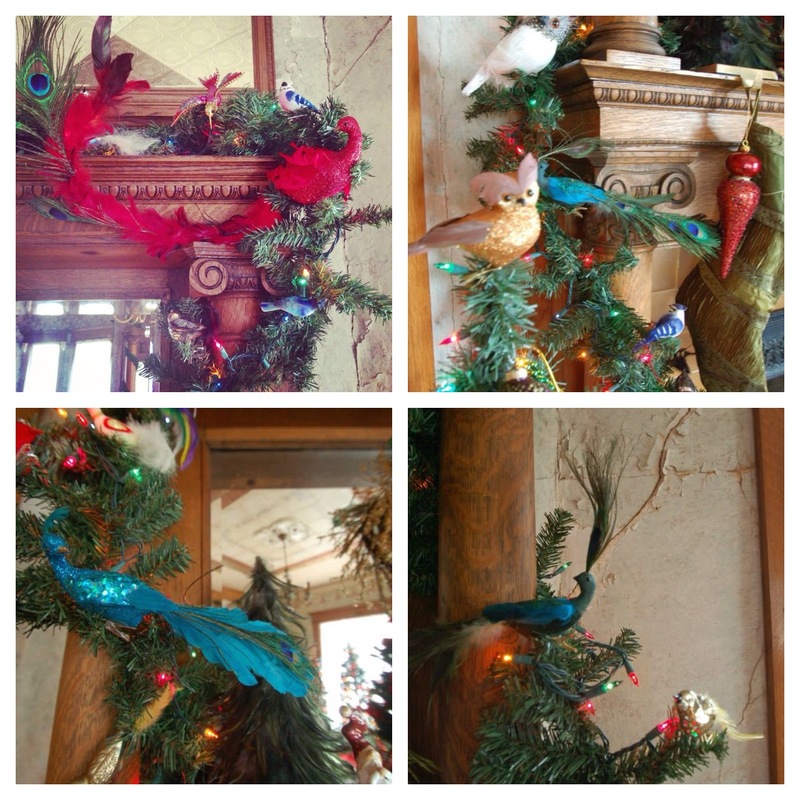 I was loving creating this birds-in-the- woods vibe, until I realized I was also hanging hummingbirds and a flamingo! So the flamingo went to the back of the tree, and I just fantasized that the hummingbirds hadn’t quite finished migrating to the south for the winter. And although I’m a year too late for this post, my vote would be 5 gold rings because a girl can always use more bling.